What you may not know is that you can find out how much someone has given and to which candidate they have given in any political race. Nonprofiteers, this is important information to know. I’ll tell you why in a second. First, you should know that there are free lookup sites available from the Federal Election Commission (FEC) and from OpenSecrets for federal races. Keep in mind that an individual may give up to $2,700 at the federal level per candidate per race; a primary, a runoff, and a general election each count as different races. More locally, you can search in your state (the Massachusetts Office of Campaign and Political Finance has a lookup here, for example) or you can search Follow The Money, a site created by the National Institute on Money in State Politics, for gifts in any/every state. Q: If you work at a nonprofit, why should you care? A: Because research by DonorSearch has shown that people who make political gifts are more likely to make philanthropic gifts, too. In fact, a person who has given $2,500 or more in their lifetime in political donations is nearly 15 times more likely to be a charitable donor. A person who has given $1,000 – $2,499 is 6 times more likely to have given a charitable gift, and even someone who has only given $500 in their lifetime to politics is 5 times more likely to be philanthropic. So finding someone on a political donor database is an indicator that they’re probably a donor to philanthropic causes, too, which is key if you’re not finding evidence of their giving elsewhere. As you’re thinking about potential donors who might make a gift this year and you’re considering someone who is heavily invested in this election, maybe you’re thinking that now isn’t the right time to ask her for a gift. A study by Blackbaud of the 2012 election cycle showed that people who gave to political candidates in 2012 actually gave slightly more to charitable organizations than they had the year before. Further, people who did not make political contributions actually slightly decreased their giving from the year before. 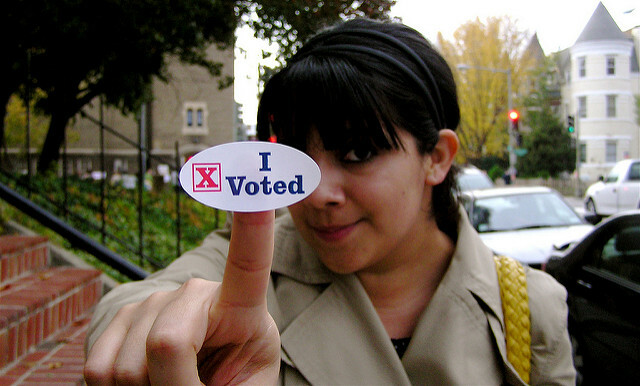 So, find out if your donors are politically active. Even though someone with much higher capacity may only have given $2,700 to a candidate, it may indicate that they like to be seen as someone who plays at the top of the deck. If your relationship is strong and you have their interest in your nonprofit’s big project, it may just be a perfect time to ask for their support. *Election Day is Tuesday, November 1st. Deadlines to register to vote are speeding at us. If you’re not registered to vote, click here for information for every state. I promise that voting in this election will be among the top 3 things you will have done in 2016 and that you will feel (and be) magnificent and powerful when you walk out of the booth. And yes, the “I Voted!” sticker does make you even more attractive. The Super-Rich Have Found a New Way to Wield Political Power: Philanthropy, by David Callahan, The Nation, August 5, 2016. Giving Differently: Liberals and Conservatives Have Radically Different Views of Charity, by Tom Watson, Forbes, June 1, 2012. Blackbaud Study Uncovers the Impact of Political Giving on Charitable Giving, Blackbaud Press Release, March 17, 2016. Learn more at the FEC website about limitations on donations to federal candidates, political action committees (PACs) and SuperPACs. Learn more at the National Conference of State Legislatures website about state limits on political donations. Many states have them, but 12 don’t. NCSL has a handy downloadable pdf outlining the rules for each state here.